As the sayings go, time is money and knowledge is power. 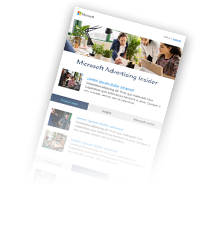 At Bing Ads, we’re always looking for ways to save you time and provide more in-depth knowledge of our marketplace to enable you to more effectively reach new and existing customers with your marketing message. Over the summer we spent time working with advertisers like you on three new capabilities which use AI and machine learning that to address needs that are currently unmet across the landscape of digital advertising tools. A key goal for our team this year has been to evolve the performance reporting experience from simply generating reports and charts to using machine learning to provide actionable insights along with your performance data. Search marketing is a very competitive business, especially when one considers the value of being the top result on a page versus other positions. Understanding which competitors’ ads appear ahead of yours, and why, is extremely empowering knowledge. With our new Competition tab, that insight is now just a click away. The Competition tab is separated into two sections. The auction insights section contains a revamped version of our auction insights report, which now shows how you’ve fared against competitors over time. The charts provide rich visualizations including the ability to segment the data using metrics such as time or device as well as filter down to specific competitors. The recommendations section provides custom tailored advice based on our analysis of your ads, your competitor’s ads and how users interacted with these ads to show you can beat your competition and appear higher in the search results. There are few things as frustrating as seeing an unexpected spike or dip in traffic and then having to spend precious minutes or hours running reports and performing data analysis just to understand what caused your campaign’s performance to change so drastically. We have begun applying machine learning to your campaigns to understand their typical performance characteristics so that when a change seems out of the ordinary, you’ll see a performance insight notification which you can click on to see our root cause analysis of why that spike or dip occurred. Our machine learning system will take some time to understand the patterns of all campaigns in the system, so this feature will be rolling out slowly across all advertisers over the next few months. We’ve introduced a new capability in our recommendation platform where we analyze the results of the best performing advertisers that are similar to you. Then, we make recommendations on how you can apply some of their best practices based on their settings. The first manifestation of this capability is our new location targeting recommendations feature. These recommendations will appear wherever you can manage location targets in Bing Ads, and suggest locations that advertisers like you have had success targeting. It should be noted that our machine learning system will avoid recommending locations that are outside of the area you do business. For any questions or feedback regarding these new features, we encourage you to reach out to your Bing Ads account manager. You can also ping us on Twitter, suggest a feature on the Bing Ads Feature Suggestion Forum, or send us an email with your thoughts to bingads-feedback@microsoft.com.